It is often said that London is a series of villages. I’m not sure I buy that, but I would say it’s a series of neighbourhoods. Most people are very aware of and loyal to their neighbourhood. When I came to live in London people would talk about their manor. It’s not a term I’ve heard for a while, so I suspect that those a generation behind me would find it as quaint as I did expressions from the 1950s. If my toe continues to change colour I may photograph it. For a horrible couple of hours this morning I thought it was broken. Yesterday afternoon I tripped on a paving stone and stubbed my toe. It was painful, but the pain seemed to subside. When I went to bed I saw it had turned purple. A night’s sleep, and it hurt going up and down the stairs. The whole toe is rather red and the purple patch means I shan’t be carrying out my plan to get my toenails painted after all, but the pain is minimal and I have no problem walking. More drama over the fruit flies in the compost. There aren’t a huge number and they disperse pretty quickly, but they have become the new pawn in the continuing exertion of control by one of my neighbours who thinks the compost bin should be removed. If anyone reading this has any hot tips on products that discourage the fruit flies, do let me know. The only ones I have seen promise mass extermination. No wonder that I am thinking of braving the rain tomorrow and taking MasterB up to das Boot until Thursday. Wednesday’s forecast is for for a dry day, with rain returning on Thursday. I have work on Friday and over the weekend, so I can’t stay longer. B&J, the people who are to look after MasterB when I am in Australia in November are in Australia now, so in a rather neat quid pro quo, MasterB and I are doing a bit of housesitting. We’re not staying there, just keeping an eye on the place, spending some time there, watching the supersize television, and in MasterB’s case, exploring the house in detail. I don’t know quite where he has been as I haven’t followed him, but he has meowed at me through the banisters as though reproaching me for not bringing any toys, and has disappeared into the upper reaches of the house for stretches of time. Back to work this morning and I was amazed at how many people were about. Some neighbours are coming round shortly for drinks and nibbles, so the party season has not entirely given way to shopping in this locale. Let it last. The build up is long enough. The shops were heaving on Christmas Eve when I popped round to the largest of our local supermarkets to recycle some old batteries. I can only think the compulsion to head up to the West End and the Sales is born of habit rather than need. I’ve had a rest from shops and the internet. It’s been really nice. I was offered a place at the dinner table on Christmas Day by some well meaning neighbours. I smilingly refused. I’d have been countimg the minutes. We’ve been in and out of each other’s houses, and I am uncomfortably aware that the cheese I am serving tonight falls a long way short of the cheddar I was given on Christmas Day morning when we sat in front of a log fire sipping bubbly. It’s a different set of neighbours tonight, so I am hoping they are less fastidious. The Prosecco should please at least. The jigsaw is coming along. MasterB seems a bit confused by it, but he’s only walked across it, not lain down in the middle, so my tactic of fussing him hugely every time he comes near it seems to be staving off any Love Rival behaviour. knew she was there, I had to view the photo in full screen to find her. She’s called Loopy, and I met her this evening while enjoying a beer in her owners’ gorgeous garden. It was a long day on my feet, and I had popped into the shop for some beers, halloumi and olives. I forgot the olives but met one of my neighbours who invited me round to meet the cats. I accepted gladly, and went home to change out of my work gear, and let my toes wriggle free after a day in shoes. MasterB went out, came in, ate, went out again. Today has been warm and sunny. Odd, because it is both Wimbledon and Glastonbury, usually a sure fire combination to bring howling winds and torrential rain. I went to visit my neighbours. Their flat is to die for. Every inch cleanly planned, and although they have lots of CDs, tapes, even vinyl, somehow it seems spacious and stylish. A far cry from my own cluttered home. They warned me that although Loopy is friendly, Nino is more nervous. Sure enough, Loopy immediately came to investigate me, sniffing my hand and allowing me to rub her head. Nino retreated to the back of the garden and looked at a book. 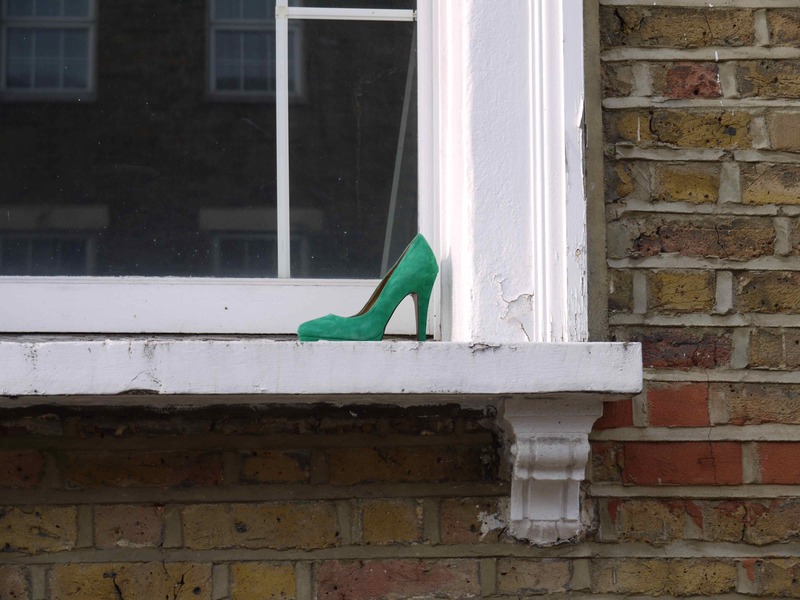 I noticed this shoe on a windowsill the other day. This afternoon I had my camera with me when I went by again. As Loyd Grossman used to say, who lives here? I was just going out after lunch when I met a neighbour. She can be quite loud, and Not Cat loves her. After we had discussed various issues affecting life in the block – people putting plastic bags in the recycling and chicken bones in the compost – she told me that the ginger ninja had visited another neighbour’s ground floor flat, gaining entry via an open window. 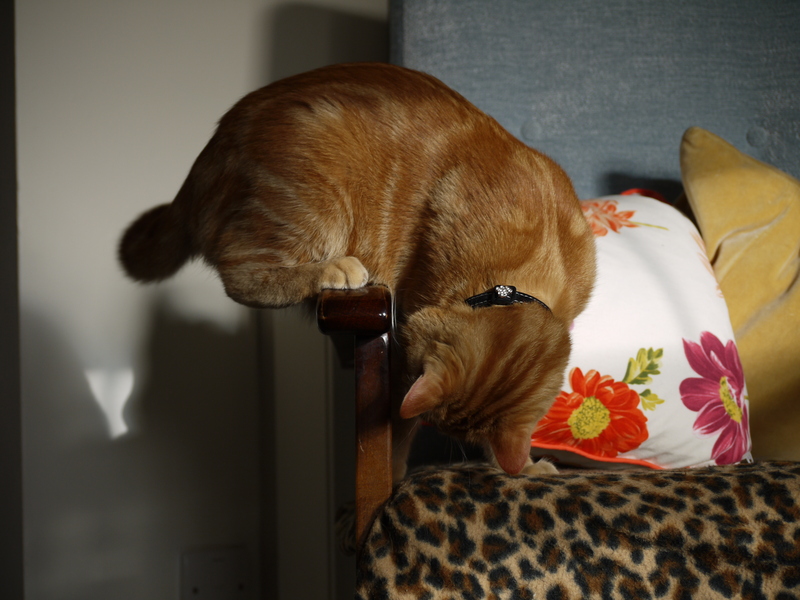 He wasn’t actually seen, but he left a trail of muddy paw prints across the newly changed bed linen. Here he is wreaking havoc at home earlier today. Not Cat likes to see what the neighbours are up to. This was what I saw earlier today when I looked out of the window. I played about with Smilebox for a while and settled on this arrangement. Pictures of the riots and their aftermath were beamed all around the world. It’s easy to imagine the place as a city under siege, or where the inhabitants are all at each others’ throats day and night, snarling and aggressive.